February 26, 2018 / Flatbush Neighborhood Brooklyn / NYC Neighborhoods / NYC Politics & Government / News Analysis & Opinion / Gotham Buzz NYC. On Tuesday evening, February 13th, I made my way south toward the Kings Theater in the Flatbush neighborhood of Brooklyn. It was an unseasonably warm February, with temperatures descending into the 40’s. I disembarked from the G subway at Church Avenue and headed east toward Flatbush Avenue, taking the opportunity to walk through the Prospect Park South neighborhood. 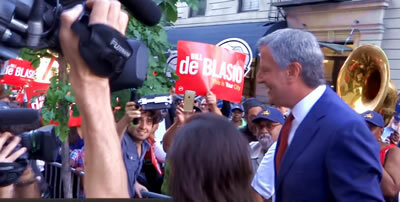 When I arrived at Kings Theatre I found a number of people engaged in the exercise of their free speech rights, chanting for an accelerated pace of the reform initiated by Mayor de Blasio four years ago. Once inside the theater I paused for a few minutes to take in the dazzling beauty of the 1929 theater built by Loews as a movie theater. The soaring arches and the ceiling had been restored in a renovation that was completed in 2015, at which time the Kings Theatre reopened. I walked up the stairs to look down into the lobby from the balcony to fully take in the architectural and artistic statement of an earlier time. According to Wikipedia the Kings Theatre had been closed since 1977, named to the National Register of Historic Places in 2012, following the initiation of its restoration by the City in 2010. 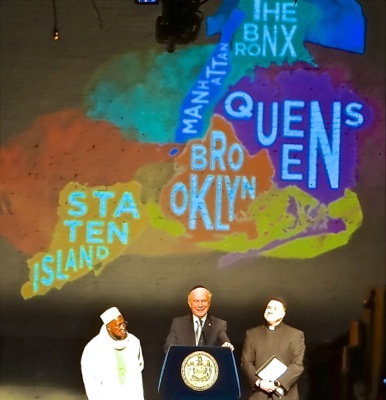 Brooklyn Continues to Preserve its History & Queens does What? It’s nice to see this kind of preservation being done in Brooklyn – it’s unfortunate that the government officials in Queens don’t take the same sort of initiative to preserve more of the history of that borough. In 2017 a similar, although admittedly less expansive theater on 82nd Street in the Jackson Heights neighborhood of Queens, was demolished. And in 2010 the landmarked mansion owned by the Steinways of Steinway & Sons Piano - built of granite in the 1850’s, sitting atop about two and a half acres of land, and in very good condition - came on the market with an asking price of $2.5 million. The house was only blocks away from the piano factory where handmade pianos are still produced to this day and was the residence of one of the most influential, historically and culturally significant people in NYC and Queens of the latter half of the 19th century. In an unbelievable failure of leadership in the borough of Queens – the Steinway mansion was not purchased by the government - nor was any meaningful attempt made to preserve it for the public - even though the mansion remained on the market until it was acquired by a developer in early 2014 [they had nearly four years to buy it]. The real estate developer subsequently built on the adjacent acreage – making back significantly more than he paid for the entire mansion, while still leaving him with ownership of the mansion. The future of the mansion itself remains unclear, as it is still in private hands, but because it has been landmarked, the outside of the mansion must be preserved. Click here to read our report about the Steinway Mansion and the travesty of the broken preservation process in Queens … but I digress. Inside the theater, a Rabbi was making a speech. He was preceded by a priest, and followed by a minister, a transgender person, and the mayor’s wife, Chirlaine McCray. We were shown a film, which talked about education, housing and law enforcement – the three main challenges faced by the Mayor during his first term. And while the Mayor has made some solid progress in addressing these issues, they are likely to remain with us for many years to come. Four years ago, the Mayor campaigned on a platform designed to address the tale of two cities. Last year he campaigned on his record of achievement in addressing the causes of the economic disparities implicit in his metaphor of the tale of two cities – but he didn’t really tell us what to expect the next four years. Tonight, in his State of the City Address, the Mayor outlined what he hoped to achieve in the coming four years. 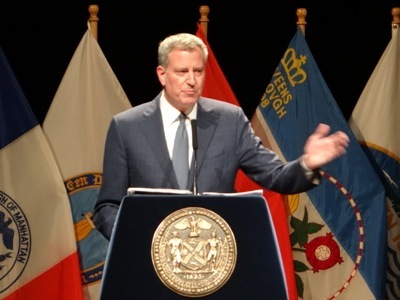 The Mayor, at his core is a bit of a policy wonk, and thus he began by outlining his plan to make New York City the Fairest Big City in America. I know that policy sounds boring - but in an age of political pugnaciousness and thoughtless theatrics – I actually find it refreshing to see an administration engaged in the process of trying to solve our social problems by using the data, analytic tools and most current social science / academic research. 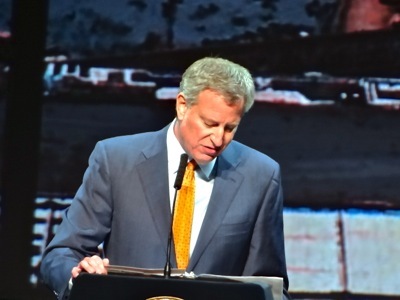 The Mayor started by touting his accomplishments which include on track to build a record number of affordable housing units, improving academic performance in the public education system [initiation Pre-K and 3-K] and continuing improvements in community safety, even while stop ‘n frisk has declined over 90% [because the Mayor added thousands of police[wo]men to the force]. He noted that all of these accomplishments help make the city more fair than it was just four years ago. The Mayor also spoke about the following topics, which I hope to add to at a later date. He also proposed an electorate engagement plan, which I may also add at a later date. Thomas Jefferson told us that a nation that expects to be ignorant and free, expects something that never was – and never will be. A government for the people by the people won’t function properly if the people don’t become engaged and remain engaged – as I witnessed on my way into the theater tonight. November 8, 2017 / NYC Neighborhoods / NYC Politics / Gotham Buzz NYC. City-wide & Borough-wide Offices. Mayor de Blasio won a decisive victory against Republican challenger, Assemblywoman Nicole Malliotakis, on Tuesday by winning nearly 67% of the vote. In fact it was a landslide for nearly all incumbent Democrats who won by comparably wide margins, including Letitia James for Public Advocate (74%), Scott Stringer for NYC Comptroller (77%), and all five Borough Presidents including Gale Brewer (Manhattan - 83%), Eric Adams (Brooklyn - 83%), Ruben Diaz (Bronx - 88%), Melinda Katz (Queens - 78%) and James Oddo (Staten Island - 75%). Mayoral Election Results by Borough. De Blasio won four of the five boroughs by wide margins including roughly 5:1 in the Bronx, 3:1 in Manhattan and Brooklyn and approaching 2:1 in Queens. Malliotakis won her home borough of Staten Island approaching 3:1. Staten Island has a significantly smaller population than the other four boroughs as it has only between 20% and 30% the population of any of the other boroughs. Trump Referendum & Job Performance Approval. Several pundits speculated that in a city where Democrats outnumber Republicans six to one - this was an NYC referendum on the Trump presidency. This may be so, but some mention should also be given to how well NYC is performing vis a vis other cities in terms of jobs creation, improving performance in the public schools, fiscal management and low crime rate. New Jersey Governor Race. On the national front, newcomer Phil Murphy (D) beat Lieutenant Governor Kim Quadagno (R) in the governor race in New Jersey. Murphy received 55% of the vote while Quadagno received 43% of the vote. Murphy will replace Chris Christie (R) who has an approval rating of 19%. In exit polls, 11% said they cast their votes in support of Trump, while 32% said they cast their votes in opposition to Trump. Results for the Three NYS Proposals on Ballot. The first Proposal - to change the NYS Constitution - lost overwhelmingly with 83% voting NO. The second Proposal - to take away pensions of some government employees found guilty of some crimes - won overwhelmingly with 73% voting YES. And the third Proposal - to allow some 'development' in public parks won in a close vote - 52% vote YES while 48% voted NO. Virginia Governor Race. In Virginia, the latest polls were once again off significantly, predicting a tight race that wasn't. Democrat Lieutenant Governor Ralph Northam won 54% of the vote while Republican Ed Gillespie who was the former Chair of the Republican National Committee won 43% of the vote. Gillespie won the rural parts of the state, while Northam won the urban areas. Gillespie was reported to be using Trump-style campaign tactics to win the race, but from Japan, Trump distanced himself from Gillespie's loss. We Elect Pols but Not Publishers. In the graphic at right, you can see the pill face of the unhappy Billionaire which I superimposed over the face of the Mayor. 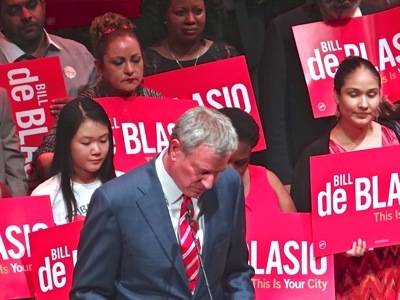 The power-hungry, media mogul's outlet had published the headline 'Stuck with the Bill' - which he published in defiance of the two-thirds of the NYC voters who came out to re-elect the Mayor. He appears to be working toward conquering the U.S. so he can make us a 'Fox Nation', like he did Australia. We don't get to elect publishers, but every time you purchase one of his papers, or click into his TV stations or websites, you are indirectly supporting him [NY Post, Fox News, WWOR Ch9, WNYW Fox Ch5 and the WSJ]. Some of the people in his organizations do good work, but many of those he puts front and center, appear to be highly paid propagandist mouthpieces who push what appears to be his greedy, deceitful, power-grabbing agenda. The story below provides more detail. 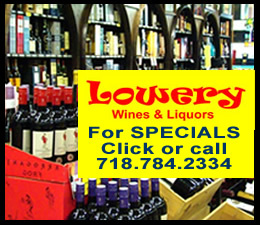 November 5, 2017 / Queens Neighborhoods / Queens Politics & Government / Queens Buzz. The New York City general election is this week, Tuesday November 7th. The polling booths will be open from 6 am to 9 pm Tuesday. To find your poll location click on the graphic at right. Once on the website, input your address, and then click the small icon to the right of it to get the results of the search. I hope the NYS Board of Elections does better cyber security on their voting systems than they do web design for this site, as the tiny arrow mentioned above is easily overlooked. There are three Referendums on the Ballot. This is where it appears that all the lobbyists would re-write the NYS Constitution to favor them and their interests, and screw the general public aka you. Their argument is to streamline government, but democracy works slowly for a reason - as it takes time for the general public to become aware of issues and then to organize in time for a proper vetting. That's why our Founding Fathers included so many checks and balances in the system - to give us - We The People - time to react. This is where a public official who's found guilty of a felony that violates the public trust, loses their pension. This is targeted only at a certain class of government officials - not all of them. Voting Yes, mitigates the effort to expand the scope of government officials covered. It seems an unfair application of the law and I don't know who drafted this or why they limited it. This is what looks like the creation of a first opening for development in the Adirondack and Catskills parks. It's not specific to any identifiable project and open ended, which looks like giving government officials / developers a blank check. Each project should be evaluated on its own merits. October 15, 2017 / Upper West Side Neighborhood UWS / Queens Politics NYC / News Analysis & Opinion / Gotham Buzz NYC. 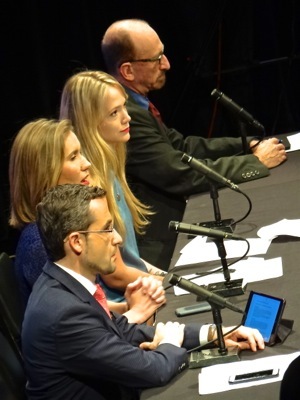 I attended the Mayoral Debate at Symphony Space on Tuesday, October 10th, where former NYC Detective [1970 – 1985] and security firm businessman Bo Dietl [Independent], New York State Assemblywoman Nicole Malliotakis [Republican Staten Island] and Mayor Bill de Blasio [Democrat] squared off for one of two general election debates. 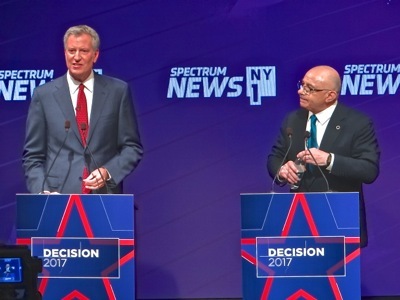 The debates are sponsored by the New York Campaign Finance Board and are a requirement for those candidates who receive matching funds. Each candidate came out and made opening statements. Bo Dietl talked about his time working the streets as a policeman in the 1970’s and 1980’s and how since then he has run a successful security firm that also employs minorities. He described his two opponents as Column A and Column B candidates. Nicole Malliotakis told us how she is the first member of her family to obtain a college degree and a Masters of Business Administration and that she is the ‘American Dream’. She went on to say she would fix our schools, transit system and homelessness. Bill de Blasio said that his two opponents were both right wing Republicans and that he was the only one that would stand up to Trump. He went on to say that crime is down, test scores at NYC public schools are up, but that there’s more to do and he needs New Yorkers’ help to continue making progress. 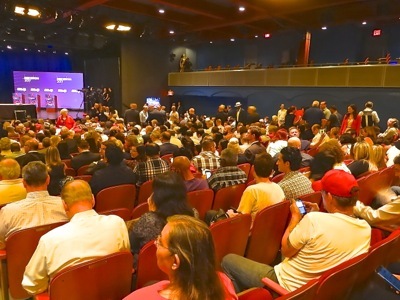 There was a small, but very boisterous minority of rude and disruptive people in the audience, who began their noisy tirades with the opening statements. It wasn’t until near the end of the program – that one of [several of] the loudest shouters and screamers was finally escorted out. 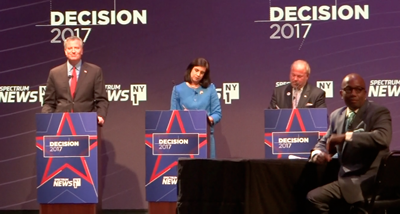 Click here for a fairly full recount of the NYC Mayoral Debates with Malliotakis, Dietl & de Blasio. 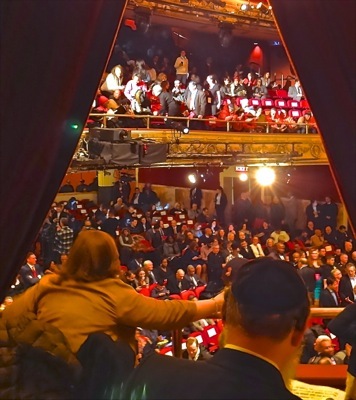 In the photo at right is the Apollo Theater as seen from one of the balcony booths prior to the beginning of Mayor de Blasio's 2017 State of the City Address. GB LINKS. November 8, 2016 / Manhattan Neighborhoods / Manhattan Politics & Government / Manhattan Buzz NYC . The New York State general election is today, Tuesday November 8th. To find your poll location click on the graphic at right, noting that after you input your address you have to click the small icon to get the results of the search. The primaries were held on Tuesday, September 13th, 2016. September 20, 2016 / Chelsea Neighborhood / Manhattan Neighborhoods / News Analysis & Opinion / Manhattan Buzz NYC / by Michael Wood. Saturday evening, September 17th, at around 8.30 pm a bomb went off in a dumpster near 131 West 23rd Street [just off 6th Avenue] in Chelsea. While a number of people were injured by the debris [29 in total], thankfully nobody was killed, and all 29 of the people impacted have been released. The photo at right shows the scene were a small bomb exploded on Saturday evening in the Chelsea section of Manhattan. NYS Governor Andrew Cuomo was quick to inform the public that the bombing was a terrorist act, but that it did not appear to be linked to international terrorism. Today, just three days later, it appears the bomber may have been influenced by a trip taken abroad. 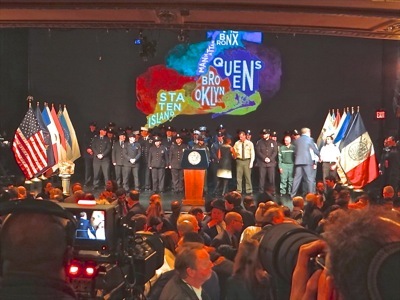 At the time of Cuomo's announcement, he appeared to be continuing what seems like an ongoing effort to upstage the Mayor, by being the first to speak to the press and by sensationalizing the incident using words like terrorist [headline grabbing]. The Mayor was far more circumspect when he spoke, telling us only that based on the evidence gathered at the time, the act appeared to be intentional. The Mayor ended his remarks with that terse statement - telling us he would have more to say pending the receipt of additional information. NYPD Commissioner James O’Neill exercised the same caution in describing the event as the Mayor. Is Murdoch's Media Org Hyping the Bombing for Ratings & Newspaper Sales Like They Appeared to do with the Iraq War? Not surprisingly, Keith Rupert Murdoch's Wall Street Journal, NY Post and Fox News noted / lauded or applauded the Governor for helping them in what appeared to be their ongoing efforts to sensationalize the terrible act. Was their goal in hyping the bomb to sell more newspapers and increase their TV ratings? 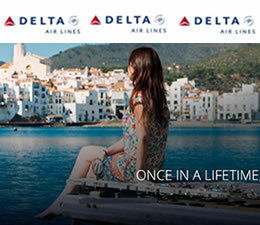 At first blush that's hard to believe - until you do the math. 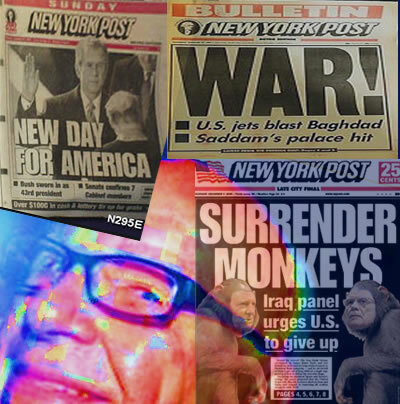 In 2002 - 2003, Murdoch in tandem with his global media organization, strongly advocated on three continents [U.S., Britain and Australia] to start the War in Iraq. Ultimately, I believe the war increased Fox cable TV and Fox News ratings, which are worth billions of dollars annually. We'll have more on this a bit later in the story. Do Bombers Seek Fame & Does Murdoch's Media Machine Provide Them with it? Is Instant Fame a Bomber's Motivation? It seems plausible that part of the motivation of a bomber might be to make the headlines / be shown on TV / become famous, even if only for what artist Andy Warhol described as one's 15 minutes of fame. See NY Post graphic to your right, where the now famous bomber made the NY Post front page while lying in bed. 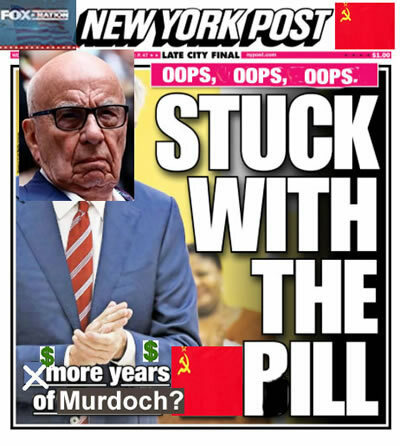 Thank you Mr. Murdoch and your NY Post? Achieving Goals By Fear Mongering? Rupert Murdoch's propaganda-oriented 'news' outlets may in fact be part of the problem - not part of the solution. Murdoch's organization appears hell bent on hyping the bombing event into an international terrorist attack, which one may surmise that they can then use to rekindle fears based on 15 year old memories, to shape the national security narrative leading up to the general election. "We have nothing to fear, but fear itself." Never mind that nobody died in this incident or even reportedly sustained any serious injuries. And based on what is known, and what I saw, there appears to be very little SUBSTANTIAL property damage. But professional propagandists never let the facts get in the way of the story they want to tell, the perspective they want to sell, so this was an event I used to watch and learn from a media organization controlled by a man believed by many, to be the world's reigning propagandist. People need to pay more attention to who they're going to listen to, to provide them with information and context about the world in which we live. The information sources they choose inevitably influence their view of the world, who they choose to represent them, what public policies they want pursued and how they go about conducting their lives. Can the Real Terrorists be Found in Murdoch's Fear Mongering Media Empire? Given that folks were out and about on Sunday, less than a day after the explosion, I began pondering whether it's media outlets like those owned by Keith Rupert Murdoch that are responsible for terrorizing the citizens of New York - and the nation - by continually repeating fear-inspired storylines / narratives? 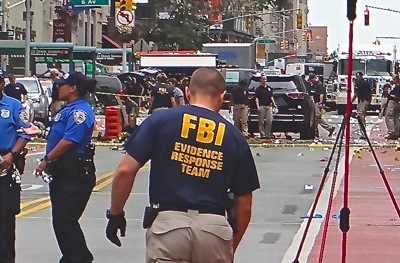 It seemed the bomber had already failed to terrorize us in New York City, where the bomb exploded, given the fact that so many of us were out and about only hours later. 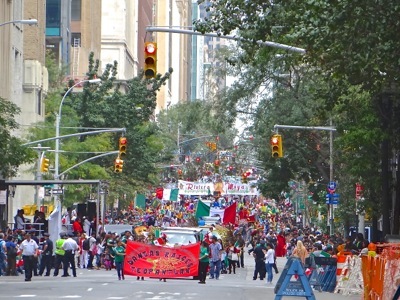 In the photo at right are marchers in the Mexican Day Parade. But Murdoch's manipulative media machine looks like it went into overdrive by broadcasting, webcasting and printing fear-inspired stories. Thus,perhaps the bomber may yet succeed in terrorizing us, with the help of Murdoch's media fear mongering machine. 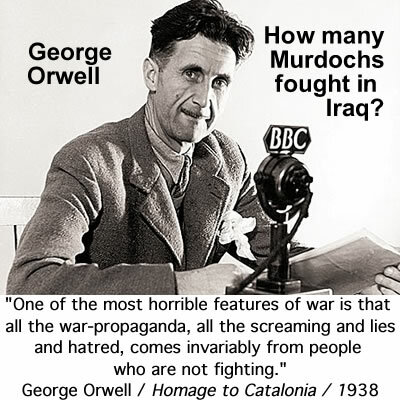 The Iraq War in 2003 was like fresh new free money, because Murdoch's organization could sell pricey TV ads for increased news ratings, while the bulk of the costs of staging the 'news programming' aka the Iraq War, was provided free to Murdoch's organization, compliments of the American, British and Australian taxpayers. Based on the recent financial performance of Murdoch's organizations, his flailing media outlets appear to be in need of this sort of low cost [to Murdoch's media empire], high ratings programming. In 2002 - 2003 Murdoch's organization appeared to use this same sort of hyping and sensationalizing of Sadam's 'weapons of mass destruction' to monger fear in America, Britain and Australia so the nations would go to war against Iraq. Only later did we find out that there weren't, in fact, any weapons of mass destruction and that it was all media and political hype used to get us into the war. Once embroiled in the war, it cost well over a TRILLION DOLLARS, and by some accounts - we're still not completely out. In the graphic at right are just a few of the strident headlines published in Murdoch media. In researching propaganda, I couldn't help but encounter propagandist works and statements made by propagandists Adolph Hitler and Joseph Goebbels. I recall as a youngster wondering how Hitler came to have so, so much power. 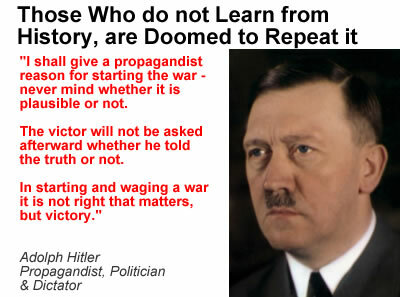 Only now do I understand, as it appears Hitler accumulated his power insidiously, by conducting mass marketing campaigns of deception, disguised and packaged in with information, facts and news. Does Fox Disinform - So Murdoch can Decide? Fox viewers have been found not only to be less informed, but actually disinformed, on subjects ranging from healthcare, to science, to international affairs. Media Matters informs us that studies to this effect have been conducted by Kaiser Health, Ohio State University researchers, Program on International Policy Attitudes, Stanford University and the National Science Foundation, University of Maryland's Program on International Policy Attitudes, Farleigh Dickinson University and an NBC / Wall Street Journal poll before Murdoch acquired the Wall Street Journal. 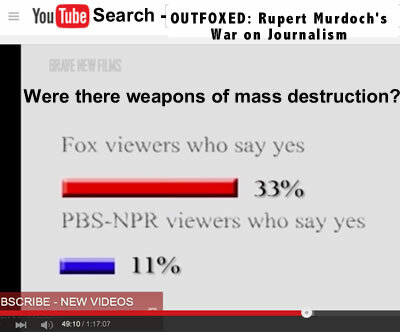 As you can see in the graphic at right, a poll which was included in a documentary entitled OutFoxed: Rupert Murdoch's War on Journalism, shows that Fox viewers tended to be more ill-informed than their PBS media peers. You can click into the graphic which will take you to the video, but we reference and link to it again later in this story where we highlight a piece in the video that proves the point and is funny in a twisted Murdochian way. Click here to view a prior piece we did on what appears to be Rupert Murdoch's assault on democracy which takes you deeper into what appears to be a long history of the billionaire media mogul's influence on electoral outcomes. In June of 2016 Murdoch's media organization seemed to provide its readers / voters the same sort of bad advice with their advocacy in favor of Brexit or exiting the European Union. We'll have a bit more on this later. Click here to read the rest of our report about what appears to be Rupert Murdoch's manipulative use of his media assets. Rupert Murdoch News Corp NY Post Hazing NYC Mayor? 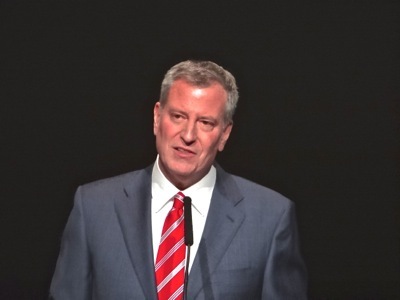 What's Behind NY Post's Media Hazing of Mayor? Will Billionaire Rupert Murdoch Profit from NY Post Attack Stories? 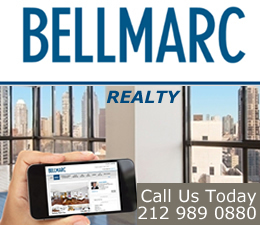 Updated May 13th / May 1, 2016 / Manhattan Neighborhoods / Manhattan Politics / News Analysis & Opinion / Manhattan Buzz NYC. The NY Post's incredible barrage of attack stories on NYC Mayor de Blasio this past month led me to believe that something was amiss. Is the NY Post Misinforming the Public? After a month long barrage of attack (ads?) stories regarding the Mayor's campaign funding, someone reading the NY Post might come away believing that Mayor de Blasio had already been convicted on numerous counts of breaking the law. As you will see later in this story, this would not be the first time the Murdoch organization's audience was not just uninformed - but rather misinformed. Murdoch's organization publishes and broadcasts 'news' accounts that appear to make significant departures from the professional standards of American journalism. I began thinking that Rupert Murdoch has found a way to skirt campaign finance laws, because many of Murdoch's organization's 'news reporting' seems more like long-winded political infomercials than anything resembling a 'fair and balanced' news report. This is especially disconcerting given that Murdoch's $60 billion plus in revenue media companies include the NY Post, Fox News, The Wall Street Journal and dozens more media properties in America and hundreds worldwide. "Independent Expenditures Do Not Include Expenditures in Connection with... A written news story, commentary, or editorial or a news story, commentary, or editorial distributed through the facilities of any broadcasting station, cable or satellite, unless such publication or facilities are owned or controlled by any political party, political committee or candidate ..."
Has Murdoch's organization found a way to skirt campaign finance laws by making huge, undisclosed, payment-in-kind, independent media expenditures in support of their preferred candidates while attacking their political opponents in order to push a self-interested Murdoch agenda, by running infomercials and attack ads as news stories? Does this practice enable The Murdoch to become a string-pulling unelected politician himself, and put him in a position to make Murdoch organization supported candidates, political puppets? There were 80 stories published about the Mayor by Billionaire Media Mogul Keith Rupert Murdoch's NY Post in the first 24 days of April. That's more than three stories per day - and not a single one was positive [a few were neutral]. The stories were authored by 20 reporters, some of whom shared the bylines. This is the equivalent of having the entire editorial staff of a medium-sized American daily newspaper, working full time on publishing stories about just one government official. I'm pretty sure that the Washington Post didn't dedicate this kind of resource to covering the Nixon Watergate scandal in the early 1970's. It seems like overkill, which is generally indicative that something is not right. I say "not right" because it has been my experience that this kind of overzealous attack oftentimes reflects more upon the prosecutor than the prosecuted. As Shakespeare said, "I think the Lady [Murdoch] doth protest too much." While working on this story I found some parallels to the 1997 James Bond movie, Tomorrow Never Dies. In the movie, Eliot Carver is an evil media mogul who uses his printing presses and television stations to hype a war between Britain and China so he can drive up the ratings of a new satellite network and other news properties, AND claim exclusive broadcasting rights in China in exchange for helping a General conspire to become Chinese President. Just five years later, in 2002, the NYT published a piece which they entitled 'Mr. Murdoch's War' which was about how stridently Murdoch urged the U.S. and Britain to go to war in Iraq, which we'll discuss in more detail later in this story. During my research a character profile of multi-billionaire Murdoch began to emerge that was something right out of the film Citizen Kane. Kane was portrayed by Orson Welles in the 1941 film as a self-involved, self-interested, power-hungry media mogul. It's worth noting that 1941 was the same year that the FCC capped TV media ownership by a single person / entity at 35%. Some pundits allege that the FCC ownership limit rule was overturned in 2002, because of behind-the-scenes influence exerted by Rupert Murdoch. 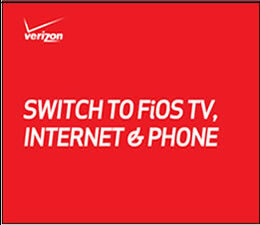 I'll provide some more detail about the FCC changes a bit later in this story. The image to your right shows a listing of the barrage of NY Post stories, based on allegations and innuendo, attacking Mayor de Blasio in just three days of April of 2016. The barrage of attack coverage in the NY Post has more the character of a propaganda machine, than a real news outlet that conforms to the American standards of journalism. Click this link for the rest of Story & Video About how Murdoch's NY Post appears to be used as propaganda machine working to oust the NYC Mayor. April 20, 2016 / Manhattan Neighborhoods / Manhattan Elections / Manhattan Buzz NYC. 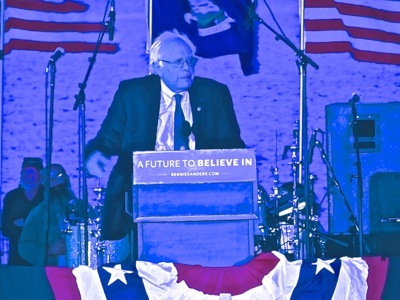 Bernie Sanders has been campaigning in New York the past week, drawing large crowds ranging from thousands to tens of thousands, as if he were a rock star. But on Tuesday, the voters weighed in and handed Hillary Clinton a convincing victory, helping her widen her delegate lead, and likely put her on the path to the Democratic Party nomination. To win the Democratic Party nomination, a candidate needs 2383 delegates of 4763 total. Within that total there are 712 super delegates, who can align themselves / vote for whomever they want but there's pressure to vote in favor of the direction that the state voted. The remaining 4051 delegates are won via the voting process and are called pledged delegates. According to the Associated Press estimate, following the NY State win Hillary Clinton now has 1428 pledged delegates and 469 super delegates, while Bernie Sanders has 1151 pledged delegates and 31 super delegates. There are 1472 pledged delegates remaining, so to win a majority of pledged delegates, Hillary has to win 598 or 41% of the remaining pledged delegates, while Bernie has to win 874 or 59% of them. Clinton has already received commitments from more than half of the 'super delegates'. Given Sanders is generally still behind in the polls in some of the larger remaining states [behind 16% in Pennsylvania and behind 8% in California], that seems a tall order. While the polls were dead wrong in Michigan, they were spot on in New York. The Sanders campaign told a news outlet Tuesday evening that they will see how they do in the contests this coming week and then evaluate their chances going forward. The Democratic Convention has been scheduled from July 25 - 28, 2016 in Philadelphia. Meanwhile on the Republican side there wasn't much news. Trump won handily defeating Kasich and Cruz. The Republicans have 2473 total delegates and 1237 are needed to win. According to the Associated Press estimate, following the NY State win, Trump has 845 delegates, while Cruz has 559 and Kasich has 147. Trump needs 392 more delegates [about 40%] to go uncontested to the Republican Convention. There are 992 delegates remaining, but according to CBS only 674 delegates are available in the remaining voting contests prior to the Convention. So Trump may have to win 60% of the remaining unpledged delegates to go to the Convention uncontested. The Republican Convention is scheduled for July 18 - 21, 2016 in Cleveland. The voting contests next week include Pennsylvania, Connecticut, Maryland and Delaware. The fat lady hasn't yet sung, but it is beginning to look like a Clinton / Trump race to the White House. 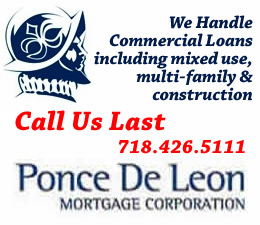 Updated April 19, 2016 from 4/15/16 / Village Neighborhood / Manhattan Politics / News Analysis & Opinion / Manhattan Buzz NYC. February 6, 2016 / Kingsbridge Heights Neighborhood Bronx / NYC Neighborhoods / NYC Politics & Government / Manhattan Buzz NYC / by Michael Wood. February 1, 2016 / Village Neighborhood / Manhattan Politics & Government NYC / Manhattan Neighborhoods / News Analysis & Opinion / Manhattan Buzz NYC. I attended Manhattan Borough President Gale A. Brewer's State of the Borough Address on Sunday afternoon. The event was held at the New School at 63 5th Avenue just south of 14th Street in the Village neighborhood. 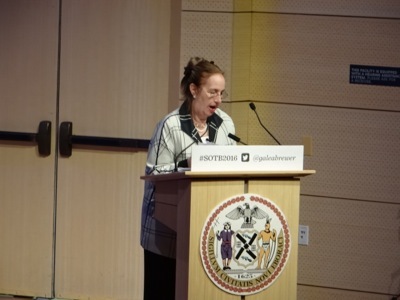 Last year Gale Brewer gave her State of the Borough Address up at Columbia University, followed by a forum where she discussed general issues facing the borough. 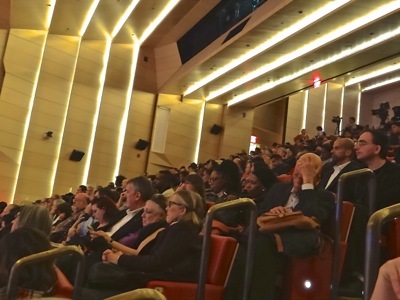 This year, at the New School, the forum topic was about engaging Manhattan borough youth through school and after-school activities. Brewer began her address by thanking all of the other government officials in attendance, as well as members of her family. She encouraged folks to keep out their phones and use Twitter to comment on the forum as it proceeded. The Twitter posts were shown on a big screen behind her, which is something I found more a distraction / nuisance than helpful - but I don't have Attention Deficit Disorder - so my opinion may not reflect the general populace. Brewer focused on about four topics: 1) affordable housing, 2) small business, 3) urban gardening, 4) police / community relations and 5) public schools. She told us that she introduced 32 pieces of legislation this year, 8 of which were passed by the NYC City Council. The bills included: 1) shielding applicants arrest records from employers so they can't discriminate against people who had conflicts with the police, 2) the passage of paid sick leave for employees where she claimed that she did all the work to get the bill passed, while the Mayor got the credit, rezoning bills for 3) Midtown that she worked on with NYCCM Garodnick and NY City Planning for Midtown East and 4) rezoning for the South Street Seaport with NYCCM Chin wherein the real estate developer finally withdrew their plans for a large tower along the East River near the Brooklyn Bridge. She mentioned something about the Zoning legislation set forth by the de Blasio Administration to enable development of affordable housing, which didn't pass, but I didn't catch the gist of it. 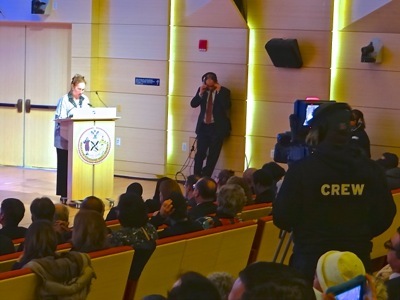 There were other things that Manhattan Borough President Gale Brewer talked about that she and her staff had done last year including, a) working with the police and the community to improve relations [not sure what], b) hosting small business round tables and an urban gardening symposium, c) organizing two mixers with teachers and private businesses in the arts and technology, and d) something about presenting a large scale map of Manhattan on the 19th floor gallery. Manhattan Borough President Gale Brewer noted that the Upper West Side was heralded as the second most livable communities for the 50 plus crowd by some organization or magazine, which also cited New York City as the 5th most livable city for the 50 plus crowd in the larger cities category. Manhattan Borough President Gale A. Brewer noted that the age to serve on Community Boards had been lowered to 16 years and that applications to serve on the Community Boards must be submitted by February 1, 2016 [now closed]. 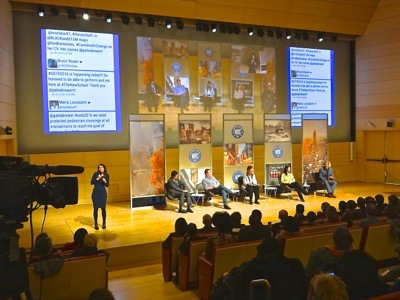 Then the panel began which featured: 1) an African American Khary Lazarre-White of the Brotherhood / Sister Sol, 2) an Asian Sumie Okazaki of the NYU Steinhardt School, 3) a Hispanic Francisco J. Nunez of Young Peoples Chorus of NYC and 4) a Caucasian Marc Murphy who is a chef / restaurateur. The topic of the discussion was how to engage youth. They talked about: 1) income / opportuity inequality and discrimination, 2) that not everyone is able or interested in being a Rhodes Scholar and hence need to be engaged with in other endeavors or they become lost, 3) that music, farming and food are several of such avenues, 4) that income segregated housing isn't good for society, 5) that immigrant parents' language capabilities limit their ability to help their children evolve, 6) that ethics should be a part of the school curriculum because it's not always taught and reinforced in the home, and 7) that managing the impact of social media on kids complicates educators and parents ability to manage social situations that go awry. Unfortunately I could not stay for the entire discussion, but I think you can get a flavor of the event from what I've reported above. Have a good year. 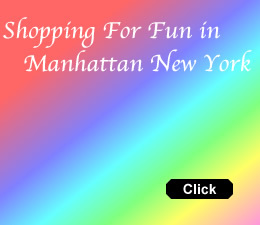 June 15, 2015 / Manhattan Neighborhoods / Manhattan Politics / Manhattan Buzz NYC. There are two important bills expected to be finalized by the New York State Legislature this week: 1) one having to do with taxation and funding for the public schools and 2) the second having to do with NYC rent stabilization law. I've been paying some modest measure of attention to both of these bills, and the following is a brief snapshot of a critical talking point in each bill. Use Public Money To Fund Private Education? From what I can gather, perhaps the most contentious item in the public education funding bill is the provision for sizeable tax deductions for those who choose to send their children to private, not public schools. As I understand it, these tax deductions would be included as part of the funding for the public schools budget and therefore will reduce what's left for the NYS / NYC public school systems. It's worth noting that private school tuition in NYC can cost in the range of about $5,000 to $30,000 per year per student. And that there are about 900 private schools in NYC alone, so depending on how these proposed deductions are ultimately structured, the funds reallocated from the public schools to private individuals would be in the tens to hundreds of millions of dollars and possibly more. You might want to contact Governor Cuomo's office at 1.518.474.8390 to let him know you support or oppose the measure, since we understand that he's been the major force pushing for this public school funding change. You can also send him an email via the Governor's contact form. 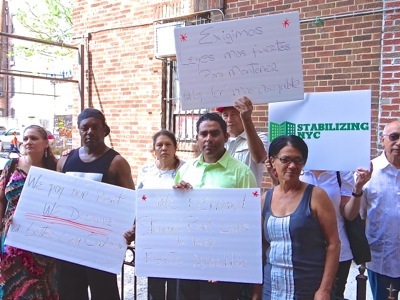 The Rent Stabilization Laws are due to expire tonight, June 15, 2015. There was talk earlier this year that there would be a push to expand or strengthen the Rent Stabilization Laws given the rapid growth in homelessness in New York City. The NYC homeless population is currently estimated at over 60,000 or nearly 1% of the entire NYC population. About 70% of New York City residents are renters, of which about two million of less than eight and a half million residents, live in rent stabilized apartments. Over the past decade or so, the Rent Stabilization Laws have been curtailed in the favor of the free market and landlords. The curtailment of rent price control legislation is believed to have spurred additional real estate development investment, as the profits of most new buildings are no longer affected by rent stabilization laws. Much of the rapid growth in homelessness over the past decade is believed to be the result of tenants losing their rent stabilized apartments, as new owners of buildings have found ways to circumvent the laws. A recent NYU Furman Center Study has shown the loss of over 330,000 unsubsidized affordable apartments since 2002, due in part to the rent stabilization legislative changes referenced above. NYS legislative insiders told me that tenants rights supporters were hoping to make legislative gains this year, but that the NYS Assemblypeople and NYS Senators opposing the changes, were going to allow the rent stabilization laws to expire as a negotiating tactic. Vicki Been, Commissioner of NYC Department of Housing Preservation and Development, informed us that the current rent stabilization laws remain in effect through the term of existing leases and leases up for renewal that are already in the hands of the tenants. She also said that tenants should call 311 with any questions or problems. 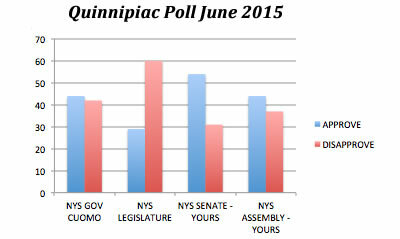 On June 3, 2015 Quinnipiac released a poll showing voters are feeling negatively about the NYS Legislature as a whole, while continuing to favor their local representatives. In the poll Governor Cuomo has only a 2% margin of those favoring him. 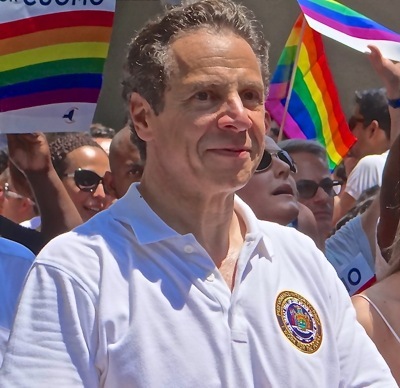 Governor Cuomo had a 44% approval rating versus 42% disapproval rating, as voters are not satisfied with his handling of the corruption scandals that have plagued Albany this year. In February 2015 Assembly Speaker Sheldon Silver [Democrat Manhattan] was indicted on federal corruption charges. And in May 2015 NYS Senate Leader Dean Skelos [Republican Long Island] was indicted by a federal Grand Jury. Less than a year ago, NYS gubernatorial candidate Zephyr Teachout, a law professor at Fordham University surprised polls by garnering nearly 2 votes for every 3 won by the governor in the NYS Democratic primary. Ms. Teachout did not have much in the way of significant private backing or union support, but won nearly 40% of the vote waging an online campaign. "... the Governor is part of the problem, not part of the solution." "Voters disapprove 60 - 26 percent of the job the State Legislature is doing, but approve 44 - 37 percent of their own Assembly member and approve 54 - 31 percent of their own state senator." "At the same time, 45 percent of voters say their state senator should be thrown out in a general house-cleaning, while 40 percent say their senator deserves reelection." "Voters are divided 41 - 41 percent on whether their Assembly member should be reelected or thrown out." As you can see, the sentiments collected in the Quinnipiac poll seem a bit contradictory, as the answers received depend on how the questions are stated. Nonetheless, this looks to be an interesting legislative week as things wind down in Albany, and as the 2016 election cycle begins to ramp up. 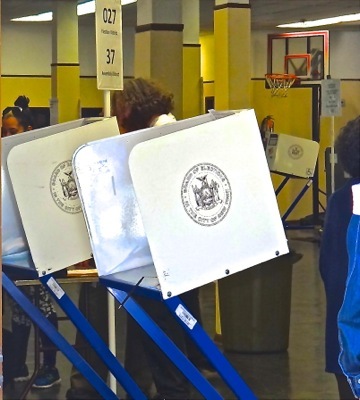 Click here to view our reporting of NYC politics and government prior to 2016. 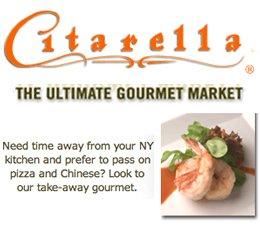 Click here to go to the Arts & Culture section of this site. 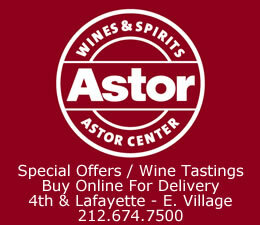 Click this link to go to the Midtown Neighborhood. 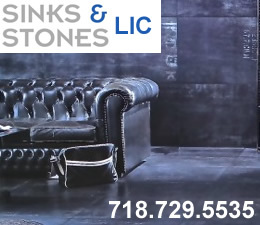 Click this link to search for something in our Manhattan Business Directory which will soon contain hundreds of listings.